Ray Rackham’s uplifting biographical musical about movie legend Judy Garland comes to the Arts Theatre for a limited season. After a critically acclaimed run at Southwark Playhouse in 2015, under the title Through the Mill, Judy! returns to London in a highly anticipated, revamped production. Judy! is the extraordinary documentation of the beloved star’s life, from an innocent girl filled with hope to a self-destructive, in-demand icon. Staged across three ages of Judy, the musical sees Young Judy receive a life-changing role in The Wizard of Oz, Palace Theatre Judy at the height of her career and in the midst of a tryst with Sidney Luft, and CBS Judy, an older and wiser woman. It suggests that no matter how hard we try to find love, we must first learn to love ourselves! Casting includes Lucy Penrose as Young Judy, Belinda Wollaston (Mamma Mia!) as Palace Theatre Judy and Helen Sheals (Downton Abbey) as CBS Judy. A memorable score is brought to life by a live band, with show-stopping numbers including the famous “The Trolley Song”, “The Man That Got Away” and “Over the Rainbow”. Conceived and directed by Ray Rackham (Follies at the London Palladium), Judy! portrays the star as a survivor in a man’s world in this poignant story that brings to life one of the world’s most famous celebrities. 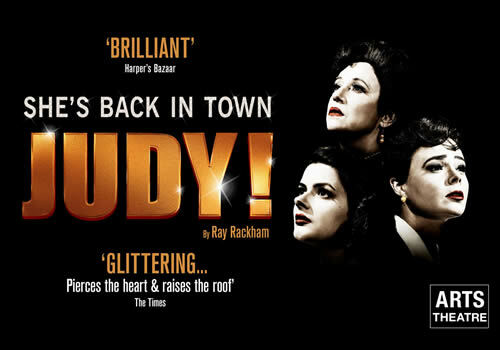 Playing a limited season at the Arts Theatre, Judy! runs from May 16th to June 17th 2017. Judy! may not be suitable for young children.